Add water and milk to a large saucepan. Season with salt. 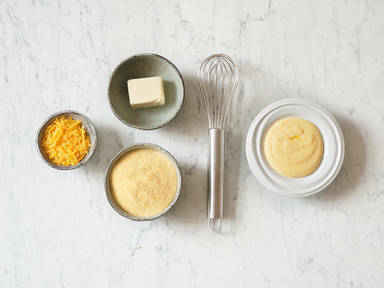 Slowly pour in instant polenta and whisk constantly until fully combined. Make sure there are no lumps left. Turn the heat low and continue to whisk for approx. 5 min until the polenta thickens. Remove from heat. Stir in butter and cheddar cheese. Season with salt and pepper to taste. Enjoy as a creamy side dish or with some shrimps.